Chrichton's World: Review Life on Mars (2006 -2007): This a superior crime drama that should not be missed. 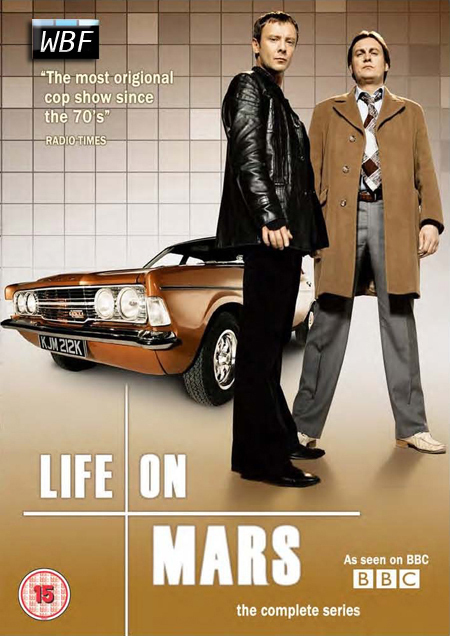 Review Life on Mars (2006 -2007): This a superior crime drama that should not be missed. This show is one of the best BBC dramas ever produced! It is a crime drama with a twist. The twist is the supposedly time travel Sam Tyler has experienced. He has had an accident and went into a coma in present day. When he wakes up he finds himself in the seventies. Adjusting to this predicament he still tries to solve crimes (as a cop only lower in rank) the best he can using his knowledge of 2006. At first sight it may seem a sort of remake of seventies cop shows. But I can tell you that it is more than that. Is he imagining all this or is he really experiencing this in order to change the future? He does encounter people he knows from the future, he even meets his parents. He sometimes hears voices, presumably doctors and relatives. Also there is a mysterious man (somebody from another police station) calling him. He seems to be on assignment but doesn't know anything about this. The question is will all these mysteries be solved? When you think you know what is going on something else happens. In that aspect the show is more a thriller. There is no shortage of humour. Gene Hunt is a great character and will make you laugh. He is the exact opposite of Sam Tyler. It is fun to see them arguing about almost anything. But still they gain each others respect. In the second season you will learn that Gene Hunt has his heart in the good place. The combination of suspense, drama and humour make every episode an enjoyable viewing experience. This a superior crime drama that should not be missed. It certainly has a wonderful and satisfying ending that will take your breath away!